The French actor Roby Schinasi(23) is a young rising star, who lives in Paris, but came to Marbella to take some time off and enjoy the summer. 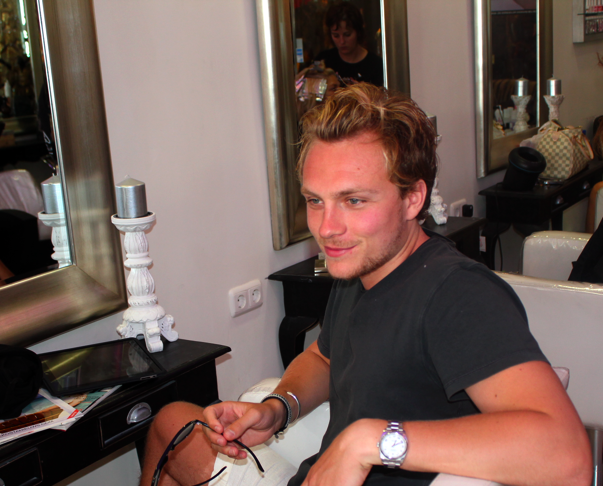 i-Marbella found the young actor from Sabrina Wageman's beauty salon in Puerto Banus - Cappucino at Cristamar centre. 1. How did you start acting and why do you like it? I just went to a casting 3 years ago and that's how it started. For me acting is a very easy and lazy job and it's also cool! 2. What kind of and how many parts have you played? Although I've been acting only for 3 years, during that time I have done almost 15 TV series and 5 movies. I have played in series like Sous le soleil, Plus belle la vie and I got the same part that Martino Rivas plays in the Spanish tv series "El internado". But in France the TV series is called "L'internat". 3. Are you also planning to try your luck in Hollywood? Yes, actually I plan on going there next year, but I have to work on my accent a bit more before I can go there. 4. How long have you been coming to Marbella? I have been coming here since I was 5 years old, because my parents have a place here. Now I come here every year and I always cut my hair at Cappuccino salon - i love it. I like Puerto Banus the most in Marbella - it's just as crazy and fun as St.Tropez! 5. How often do you go to hairdresser? I usually never go, because they do my hair at the set. But for different roles, they have told me to either grow them or to cut them. 6. Who are your favourite actors? James Dean, Marlon Brando, Johnny Depp and also Brad Pitt. Brad is not only a pretty face, but really knows how to act. so you can see various people around Marbella, i should come down to see whats going on in Marbella, sounds interesting all the life there.